French rugby is to hold a referendum asking amateur clubs to decide whether to appoint a foreign national team coach. Wales head coach Warren Gatland is among those being lined up to replace Jacques Brunel after this year's World Cup, which concludes in November. But France is one of the few major rugby nations never to have had a coach from outside of their own country. FFR boss Bernard Laporte said the referendum will take place next month. Laporte has already written to all amateur rugby clubs in France asking if they would support the appointment of a non-Frenchman to lead the side into the World Cup on home soil in 2023. Each club gets one vote in the referendum taking place between 9 and 11 April. The result will be announced on 12 April. "The 2023 World Cup is on the horizon. I want to give maximum chance to the French team to win the title in its territory," Laporte said in his letter to the clubs. "The appointment of a foreign coach at the head of the national team is one of the options. A common practice in most rugby nations, but never considered in France. "As I was committed to creating a true democracy within our Federation and because the XV of France is your team, I plan to consult you through a referendum on the possibility of appointing [an overseas coach]." 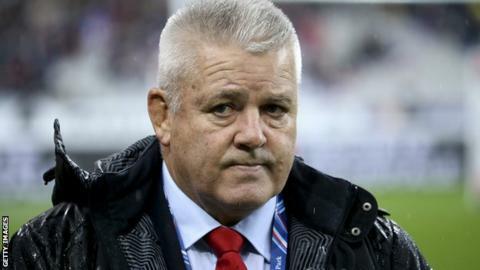 Kiwi Gatland is likely to be in high demand when he stands down with Wales after the World Cup in Japan, and is also a prime candidate to replace Eddie Jones as England boss. As well as Gatland, England defence coach John Mitchell and England's World Cup-winning coach Sir Clive Woodward are also said to be on the FFR shortlist. Woodward was a candidate to take the France job in 2015, before missing out to Guy Noves. The former Scotland boss Vern Cotter, now at Montpellier, is also expected to be in the frame.